At the forefront of energy innovation, Aquarea is resolutely positioned as a “green” heating and air-conditioning system. Aquarea is part of a new generation of heating and air-conditioning systems that use a renewable, free energy source – the air – to heat or cool the home and to produce hot water. The Aquarea heat pump is a much more flexible and cost-effective alternative to a traditional fossil fuel boiler. ** Based upon a floor area of 225m² at 50 Watts per m² using Panasonic’s T-CAP 12kW output heat pump at SCOP (Seasonal Coefficient of Performance) 3.7, Air temperature -8°C/Water temperature 55°C. Operates even in freezing temperatures (-20 °C). Panasonic’s Aquarea Heat Pump provides savings of up to 78% on heating expenses compared to electrical heaters. 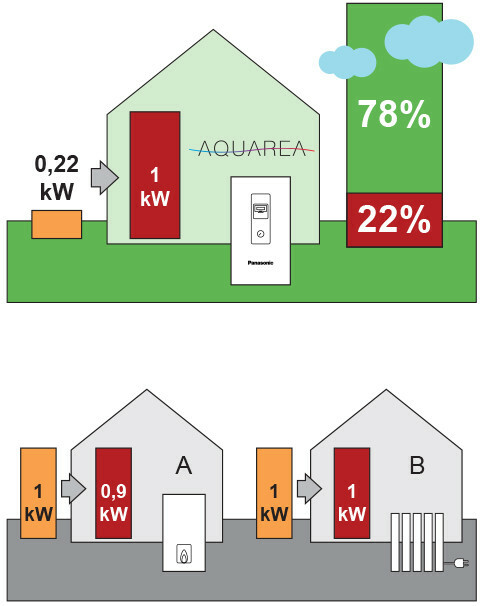 For example, the Aquarea 9 kW system has a COP of 4.74. This is 3.74 kW more than a conventional electrical heating system which has a maximum COP of 1. This is equivalent to a 78% saving. Consumption can be further reduced by connecting photovoltaic solar panels to the Aquarea system. Panasonic has clearly demonstrated it status as lead in this field with over 200 million compressors supplied and the excellent quality and reliability of its heat pumps. With a Panasonic Inverter+ compressor, you can save up to 30% energy compared to a traditional system with no inverter. With a Panasonic Inverter compressor, the heat pump is always producing heat with the maximum of efficiency and adapting the capacity to the element. 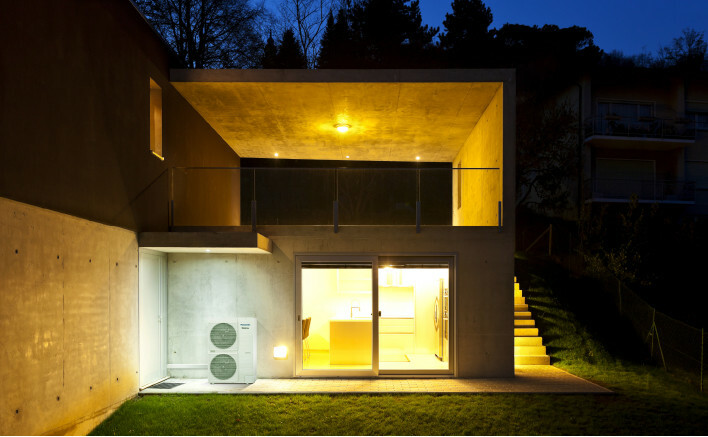 Comparing Inverter and non-Inverter heat pumps. Slow to start. Takes longer to reach the temperature set point. The temperature oscillates between the two extremes and never stabilises. The temperature falls and then rises quickly, leading to a consumption peak. Rapidly reaches the desired temperature. Adjusts the temperature: more comfort and greater savings. Keeps the temperature comfortable all the time.